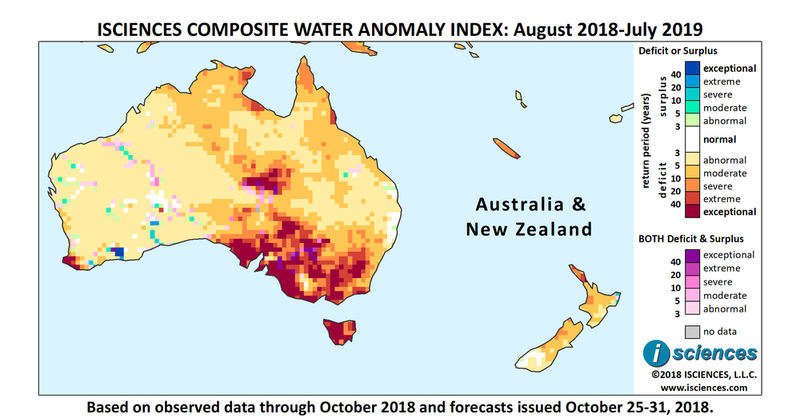 The 12-month forecast through July 2019 shows intense deficits in South Australia, Victoria, New South Wales, Tasmania, and a pocket in the Simpson Desert in the center of the country. Deficits will also be intense in the Blackwood River region near Busselton in the tip of Western Australia and pockets around the Gulf of Carpentaria in the north. Moderate deficits are forecast for New Zealand, but deficits are expected to be severe to extreme north of Auckland. Severe deficits are forecast for New Caledonia. The forecast through January indicates that intense deficits which have dominated much of Australia in prior months will retreat from most regions except the southeast, where severe to exceptional deficits will persist from Adelaide to Canberra. Primarily moderate deficits are forecast for the Murray-Darling Basin, but deficits will be severe to extreme along the Murray River. Moderate deficits will also cut a broad path from New South Wales into the center of the country surrounding the Simpson Desert. In Tasmania, deficits will reach exceptional intensity, as well as in a persistent pocket at the tip of Western Australia near Busselton and the Blackwood River region. A patch of intense surplus will persist in Western Australia northwest of Esperance. In New Zealand deficits are forecast for the northern half of South Island and in North Island, where conditions may be severe. Deficits in New Caledonia will moderate. From February through April deficits will shrink in southeastern Australia but will intensify on the Murray River, becoming extreme to exceptional. Deficits will downgrade somewhat in Tasmania but remain intense, and a pocket of intense deficits will persist at the tip of Western Australia. Moderate deficits are expected to emerge in the north across Top End in Northern Australia through the Cape York Peninsula. Deficits may be severe in Arnhem Land in eastern Top End. Deficits in New Zealand will moderate but deficits in New Caledonia may become severe. The forecast for the final months – May through July – indicates intense deficits across northern Australia while the southeast mainland returns to near-normal conditions. Some surpluses are forecast in pockets of Western Australia. Following an uptick in the Australian wool market, Chinese demand for thick-fiber wools dropped Australian prices on drought-hurt fine and superfine wool in a sharp week-over-week decline last month. While drought has created an oversupply of fine wool types, it has also hurt wool supply overall, which, combined with high demand in the luxury athletics market, has increased prices to near historic highs year-over-year. Wool supply is set to continue dropping in the coming months as dry conditions strain cattle stocks. Australia supplies over 90 percent of the world’s exported high-quality wool used in textiles. Welcome rain fell in drought-ravaged New South Wales last month, accompanied by a flash hail storm that killed 150 goats, costing some farmers their entire stock. Around 400 kangaroos also died in the storm. The Australian Bureau of Meteorology had no good news for farmers, warning Australians to brace for a hot, dry summer. In what the bureau’s manager called “astounding” odds, the likelihood that temperatures will be higher than average for most of the mainland is at 80 percent. Rainfall is forecast to be average at best for some regions, and to stay below average for others. Already-dry soils create a self-perpetuating problem, as they store more heat and drive heatwaves. Dry soils exacerbate the effects of drought as well, as low soil moisture reduces soil health and productivity, and increases topsoil losses through increased erosion.